The County Stroke Play Championship got under way at the ever impressive Ferndown Golf Club and with a sunny forecast the day was set fair for some golf with a field of 58 players contesting this year’s event. The only thing that went wrong on the day was the sun failed to turn up in a cloudy dull day contrary to that forecast!! There was some fine golf played but the pre-tournament favourite were not the ones producing the scores two of our up and coming juniors George Long Parkstone and home player James Singleton both had one under par 70’s but the only other player to go under par was Andrew Robson with a fine 69 . There were several players on level which included Tom Robson, Mark Davis, Harry Mitchell along with Stephen Robinson from Weymouth and back into County golf Broadstone’s Ross Graham. So after a hearty lunch the players were all back out in the sunshine and the early starters found scoring a little more difficult with again only four players managing to break par. County Captain David Cook had 70 as did Came downs youngster Sam Roles, but the morning leader Andrew robson was in fine form with another fine round which included fourteen pars and four birdies for a 67 giving him a 6under total of 136 six shots clear of second place, which was taken by Greg Britton who had a fine 68 with a bogey bogey start!! 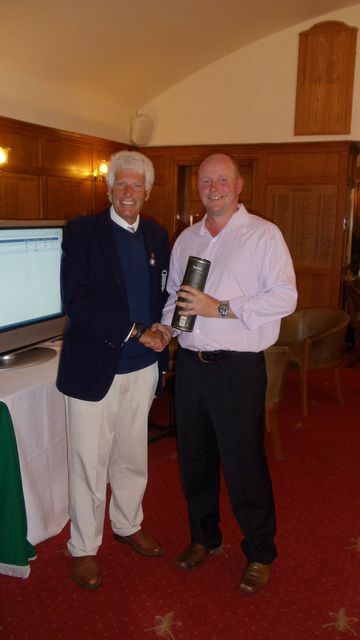 It was good enough to ensure Greg won the Weymouth Jubilee Cup. Tom Robson took the Order of Merit for 2013 just hanging on by four points from brother Andrew a fine Championship for the Robson family and Weymouth GC. We would like to thank the members of Ferndoown GC for hosting the event and our Sponsor Ringwood Brewery who kindly donate to the club a barrel of their finest ale for hosting the event. Congratulations to Alan Stickley on a Hole in One at the 183 yard twelve hole.